It all started with some leftover manure. 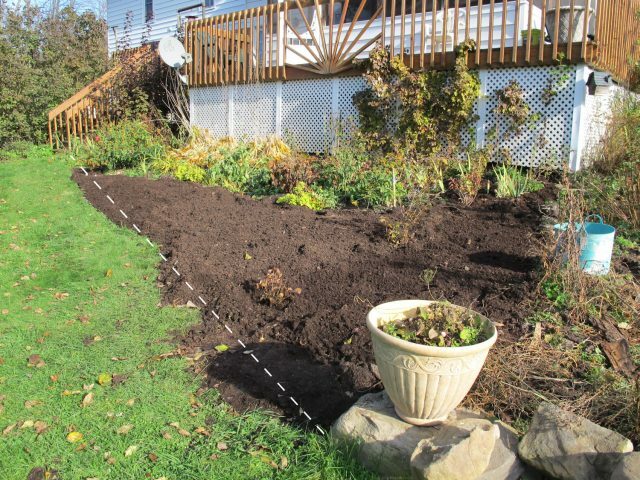 Over three years ago, I needed to do something with the remaining composted manure from a gardening project before winter came. Our house is built into a hill. The backyard is lower, making the back deck a half-story above ground level. The previous owners had stuffed some shrubs into a skinny little border along the back, which I had tidied up. 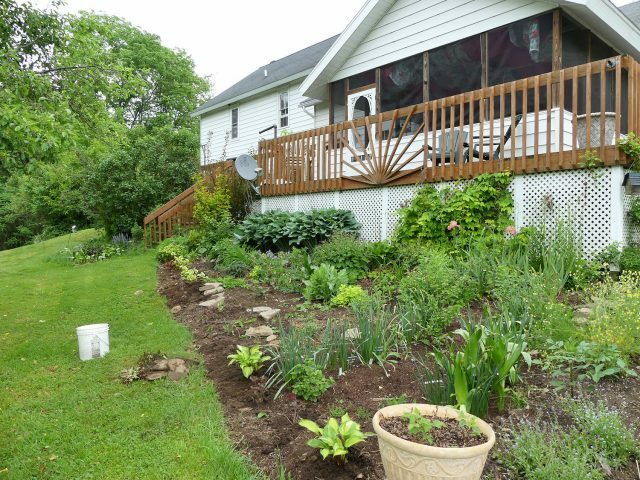 But when my daughter created a potager on the south side of the house that extended beyond the deck, it created an awkwardly shaped space that was hard to mow and just didn’t look right. 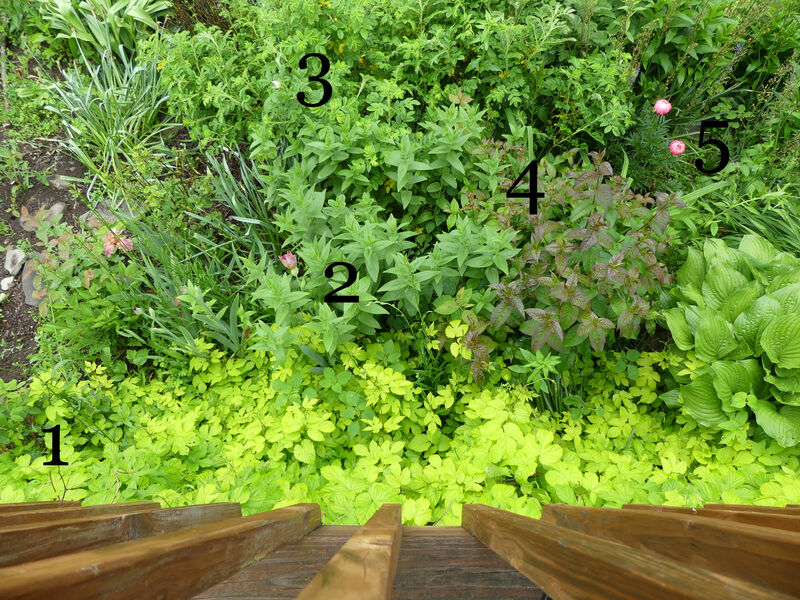 I wanted so badly to draw a line from the corner of the potager to the deck stair railing. The following spring, I had All. That. Space. to plant in. I needed some sort of criteria to help me decide what to grow there. 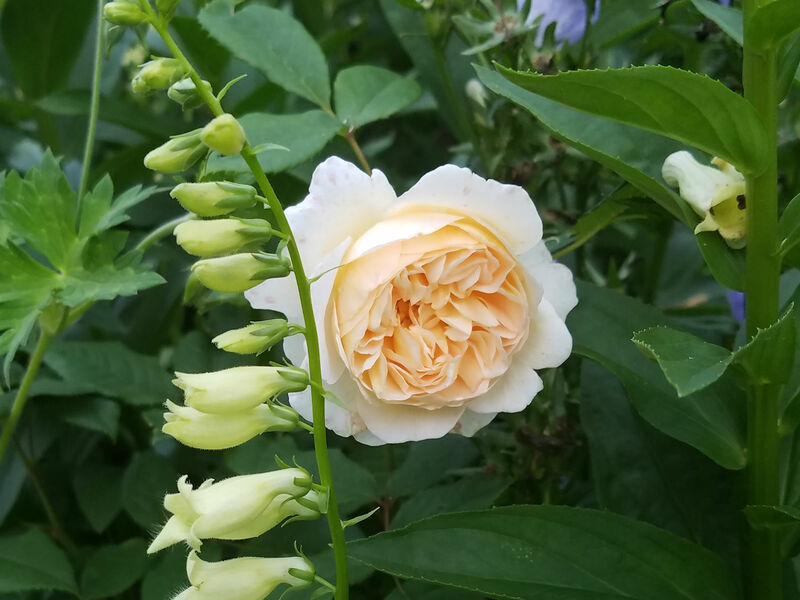 At the old house, there was a spot where I had wanted to grow a white heirloom rose like Madame Hardy, with apricot foxgloves and lavender-blue peach-leaved bellflowers. That never happened there, but I realized I had the bellflowers and I had an apricot rose (‘Crown Princess Margareta‘) from the old house, and decided I would go with that color scheme–apricot, lavender-blue, and white. 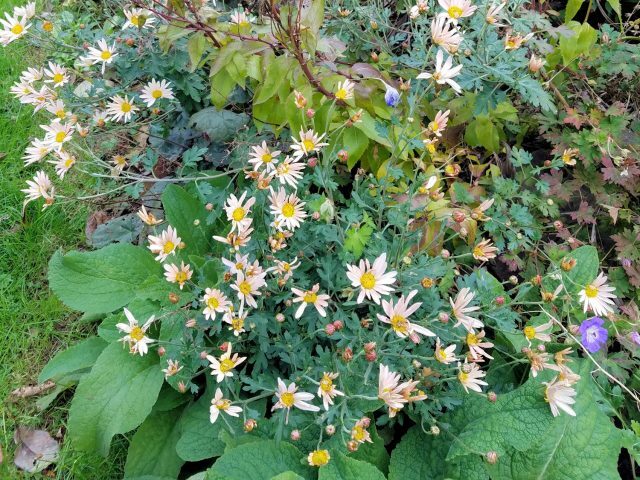 This soon included yellow-green foliage accents as well, such as golden feverfew, golden hops, and hostas, and sometimes the apricot segued into orange and the lavender-blue deepened to a dark plum. By June there were still some gaps, but the garden in my mind’s eye was looking great. Fast forward to 2018 . . . 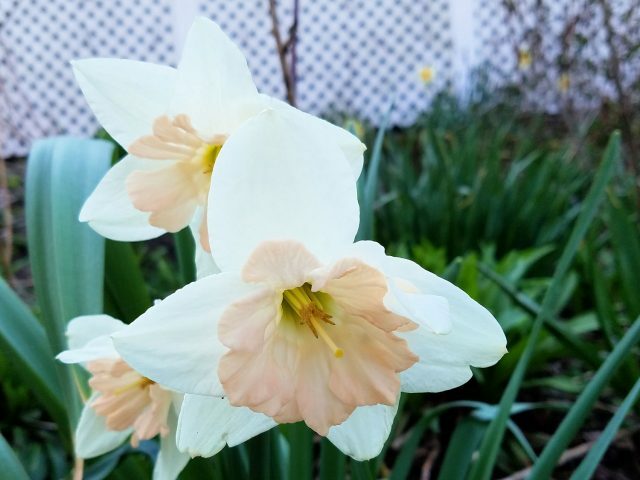 The year starts off with orange and apricot daffodils. This is ‘Kedron’ with an unnamed plum-colored hellebore. 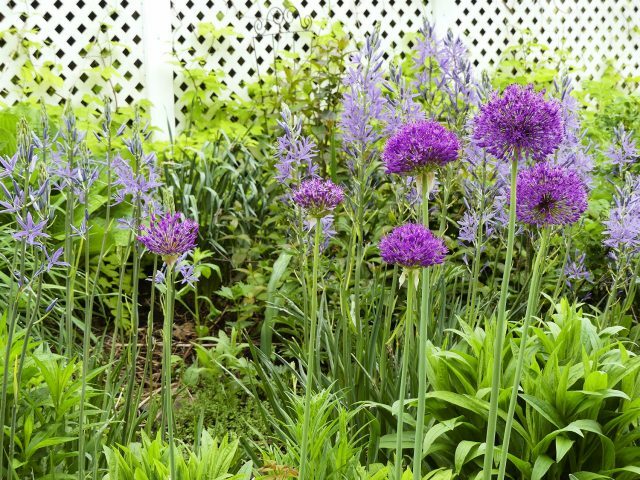 In May, alliums and camassias bloom. Note the golden hops vine starting to climb the lattice. Abelia monsanensis blooms in early June. 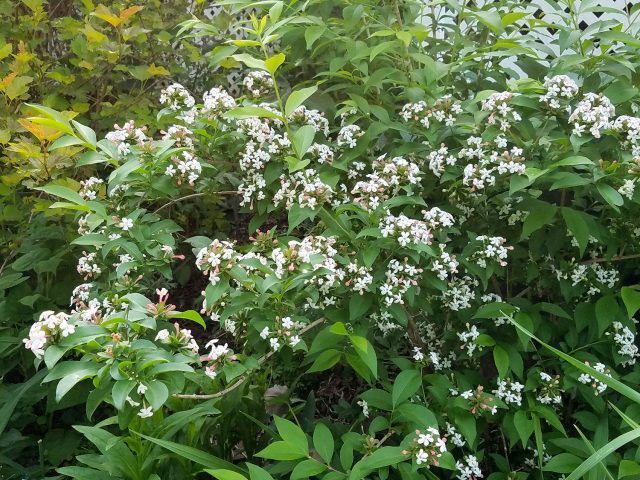 It’s wonderfully fragrant and hardy to Zone 4. 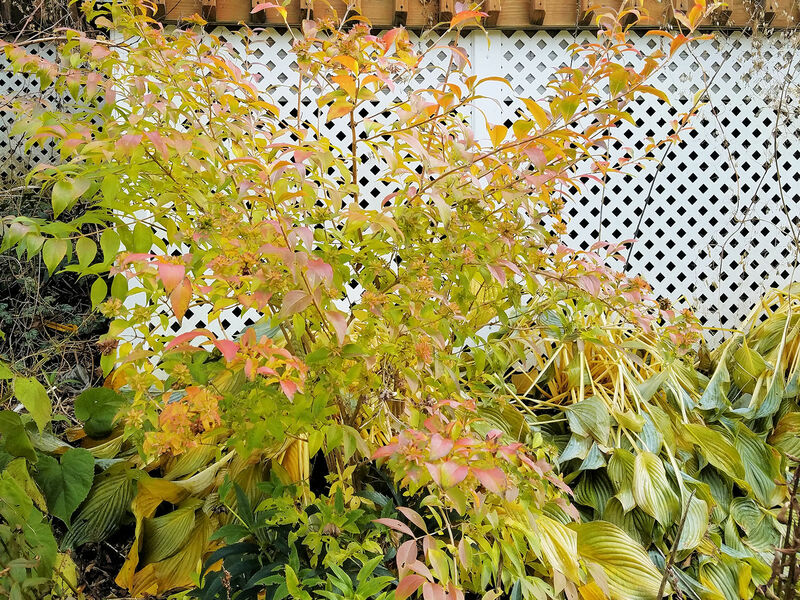 It has pretty decent autumn color, too. This is late October. This dreamy iris was growing in the Parking Pad bed when we moved in, but I moved it to the deck bed because it fit so well with the color scheme. The ‘Coral Charm’ peony moves a bit out of the apricot color range but it does play well with the other flowers. 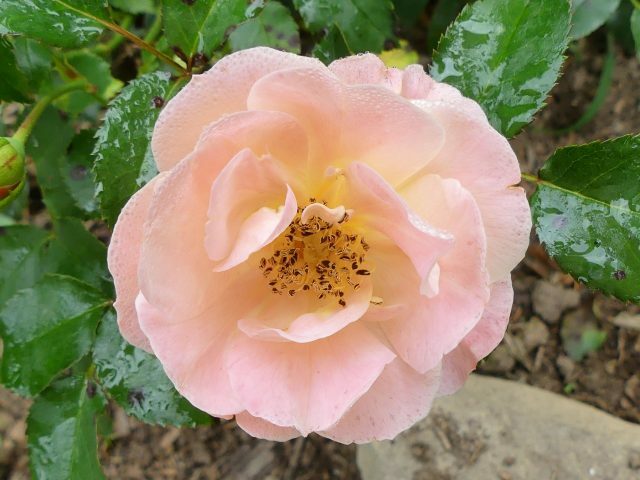 In late June and into July, the apricot roses have their first flush of bloom. 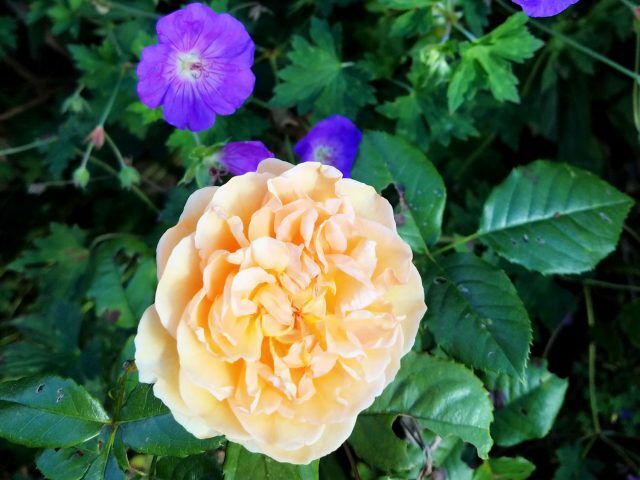 ‘Crown Princess Margareta,’ the rose that inspired this bed, consorting with some yellow foxglove. I also added a trial plant of Proven Winners’ ‘At Last’ rose, here with a hardy geranium that I originally found in the Slope Garden, probably ‘Rozanne’. Three Flower Carpet® Amber roses, also trial plants, complete the apricot palette. The yellow foxglove (Digitalis lutea) has been the big surprise of this bed. I brought one plant from my former garden, and planted it to the left of the abelia, before I widened the bed. When I saw how many seedlings had grown up around the mother plant (far more than it had done at the old garden) I was inspired to plant them in a ribbon down the length of the new bed. They have thrived beyond all expectation. 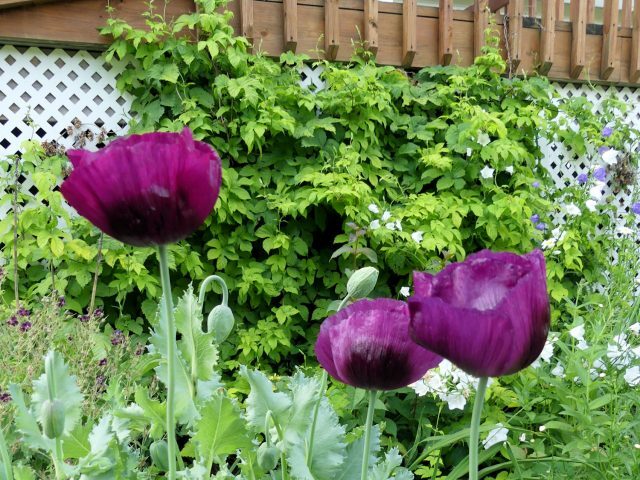 In early July, the ‘Lauren’s Grape’ poppies start blooming at about the same time as the peach-leaved bellflowers (in lavender and white), backed by the golden hops climbing the lattice. They also look smashing with the ‘Blue Moon’ dragon head. 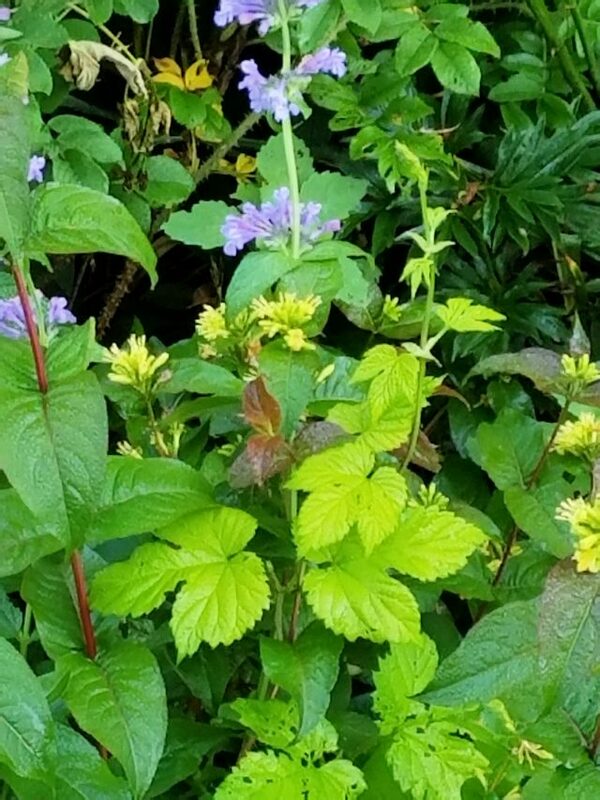 The dragon head also looks swell with the yellow flowers and dark foliage of the Kodiak black diervilla and the glowing Summer Shandy leaves. In August, the apricot theme of this bed intensifies to orange. 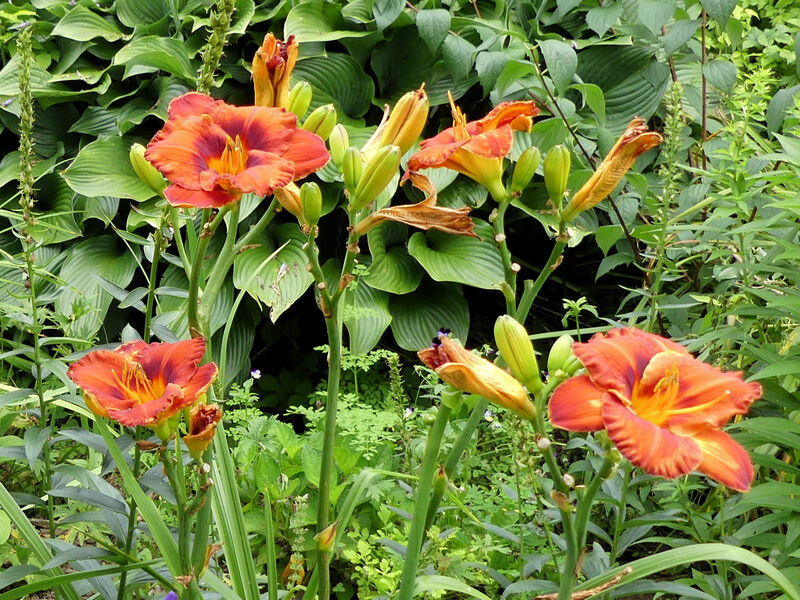 ‘Mighty Chestnut’ daylily, a trial plant from Walters Perennials, is one of the orange elements. The tiger lily (Lilium lancifolium) echoes the ‘Mighty Chestnut’ on the opposite side of the bed. In September the roses bloom again and the ‘David’ phlox joins them. ‘Arizona Apricot’ blanket flower (Gaillardia aristata) finally makes an appearance at the edge of the bed. I say “finally” because blanket flower is considered a summer-blooming perennial, but it doesn’t start until September for me. 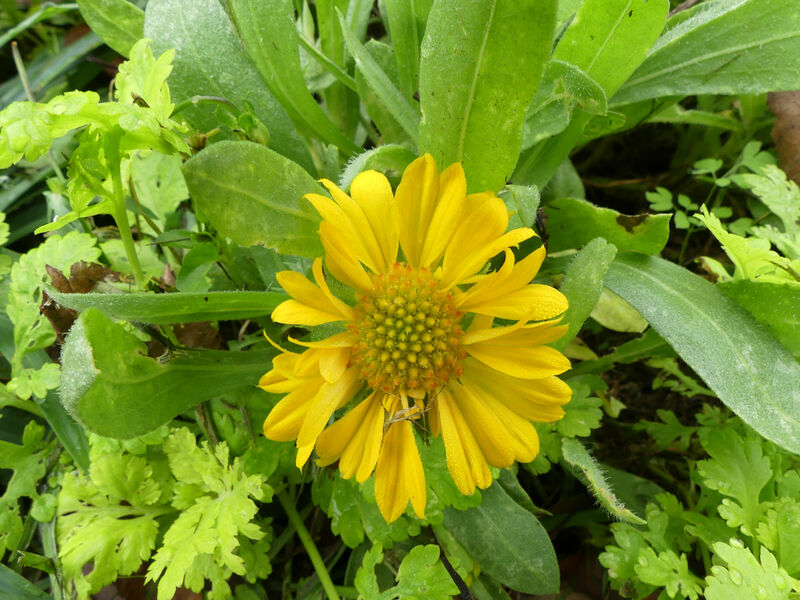 Many heat-loving plants don’t accumulate enough heat-hours until summer is almost over. (At least so it seems to me.) Hardy hibiscus is another one I have to wait until September to see blooming. Wrapping up the season, ‘Sheffield pink’ mums (which look peachy to me) start blooming in October. Yes, October! 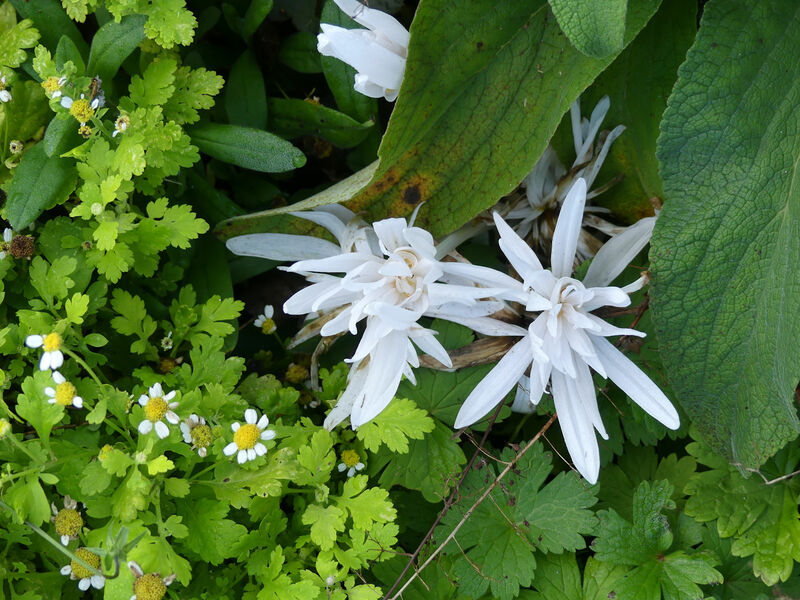 And Colchicum autumnale ‘Alboplenum’ joins them. Can you tell I’ve had fun playing with color in this bed? 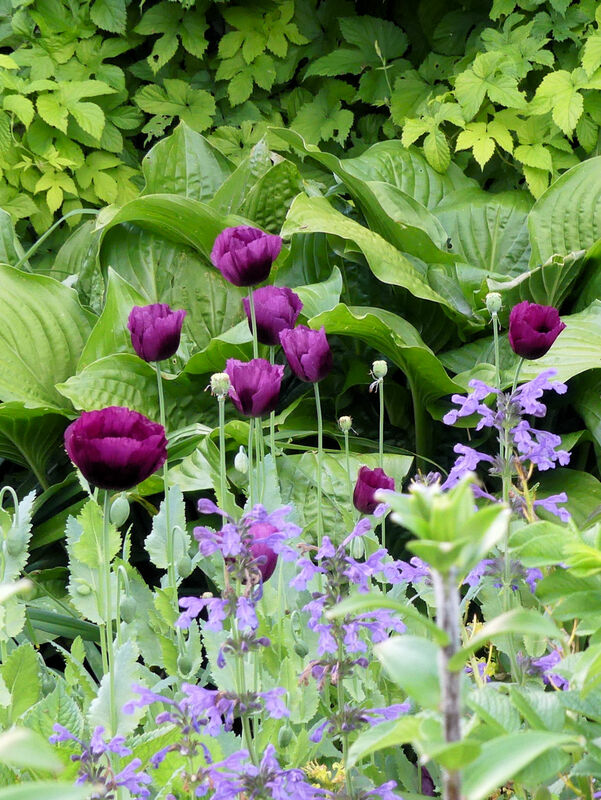 To me a garden border is like a symphony with many players contributing to the work as a whole. Some, like the golden hops and the golden feverfew, add a background melody to the whole piece. 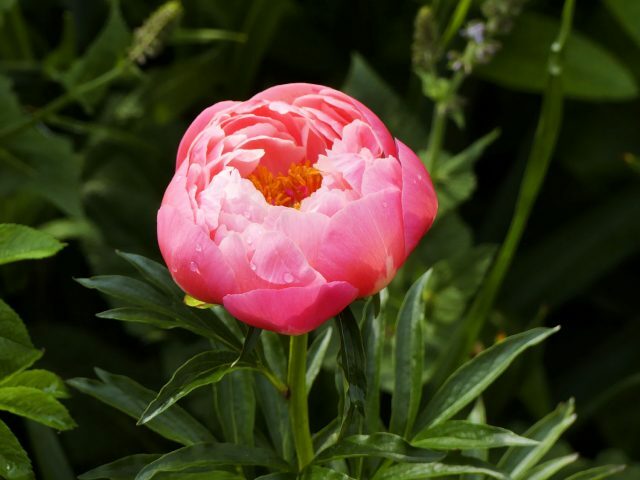 Others, like the ‘Coral Charm’ peony, have a brief but commanding performance. Many, like the roses and the geraniums, repeat in several movements, but never with the same accompaniments. 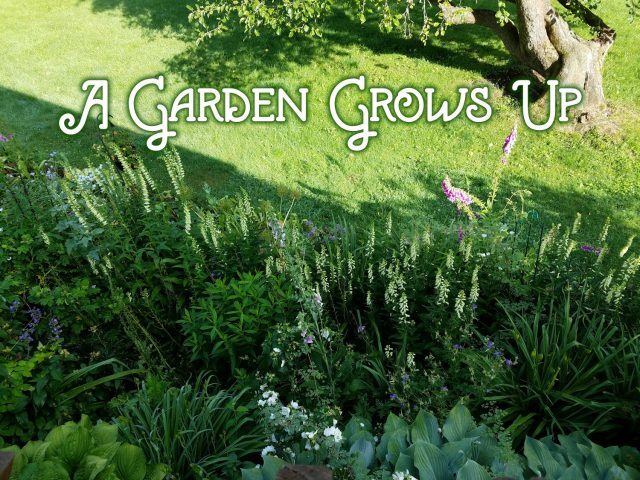 It’s all rather complicated, and the gardener often has to watch the garden bed symphony play out a time or two to understand where it’s not yet working the way it should. So I have a list of things I want to change this spring. First, the ‘Alba’ rugosa rose has to go. It’s gotten huge, and yet doesn’t produce more than a bloom or two, when it should be covered with flowers. I suspect it’s not getting enough sun, and I know where I’m going to move it. I will move irises and salvias that are already there but getting swamped into the rose’s former space. Those lovely yellow foxgloves are so tall they are hiding the daylilies (most of which I didn’t show you) behind them. 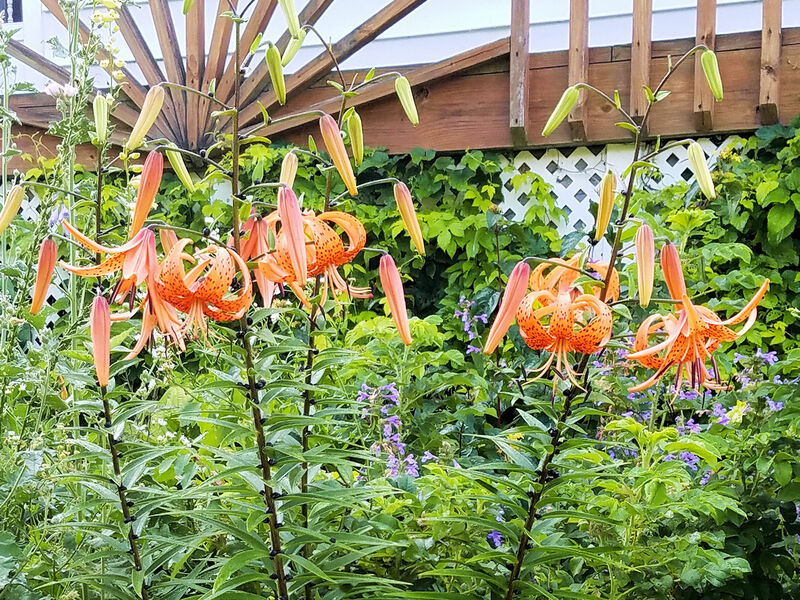 So I need to do a big switcheroo and have the foxgloves move back and the daylilies forward. 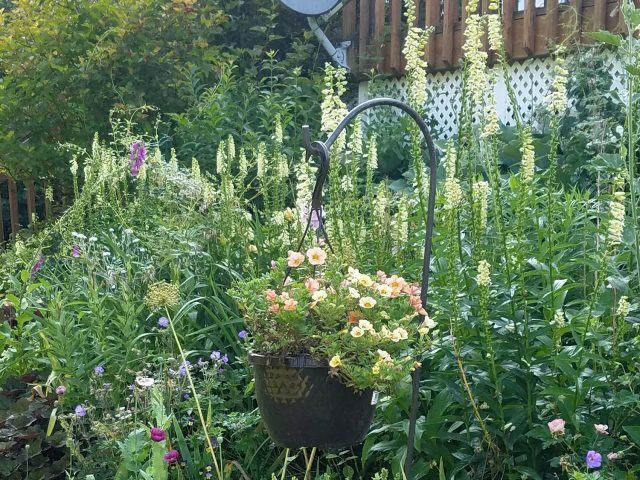 I plan to move the pink foxgloves out and replace them with apricot foxgloves that I’m starting from seed. 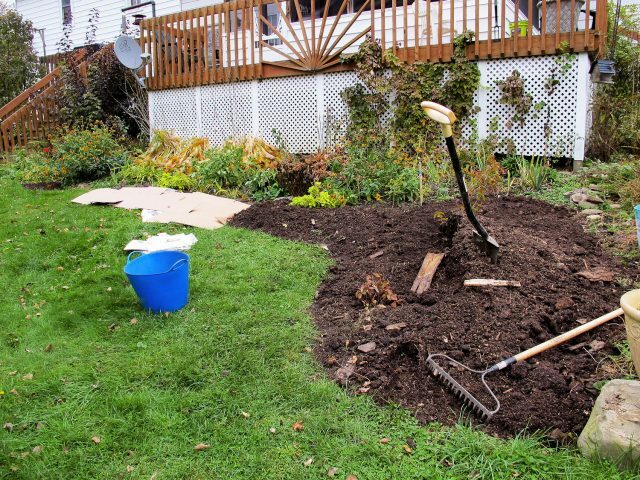 The dragon head is a spreader but I love it, so I’ll be digging some up to use in another bed. 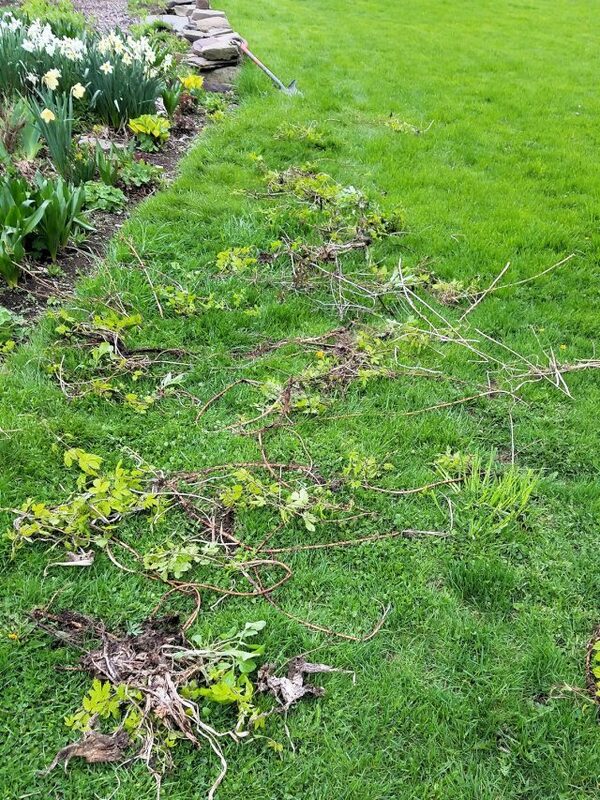 As usual, I will be checking for shoots of Summer Shandy golden hops that are growing into the bed instead of up the lattice. I received one vine as a trial plant in 2012. It came in a quart pot. The first couple of years I coddled and coaxed it up the lattice. The third or fourth year I finally realized it was weaving itself through the bed and rooting as it went. I waded into the bed and started yanking. Rather belatedly I checked back at the Proven Winners website and saw that they advised cutting it down every fall. You can bet I do now! It’s a beautiful plant, but if you grow it in your garden be prepared to show it who’s boss. I think I like the tinkering and tweaking the best of all garden chores, but the window of opportunity to rearrange plants without stepping on growing shoots or tying back neighboring plants is small, especially when the plants start growing before the ground is fully thawed. I’m looking forward to the challenge! How about you? 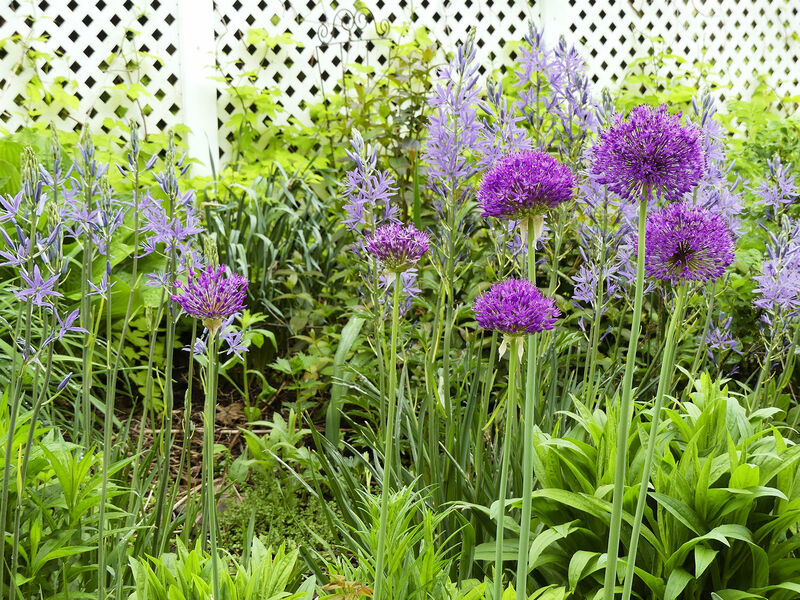 What do you plan to change in your garden this spring? 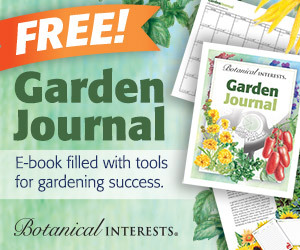 So many of us start gardening without a plan. Your post shows how much more beauty results with one. Loved this post! It didn’t really feel like a plan. More like a sketchy outline. ‘Mighty Chestnut’ daylily is one of my favorites, a wonderfully intense color. What a great color scheme and plants. Love your original rose and Coral Charm is a great Peony in my book. 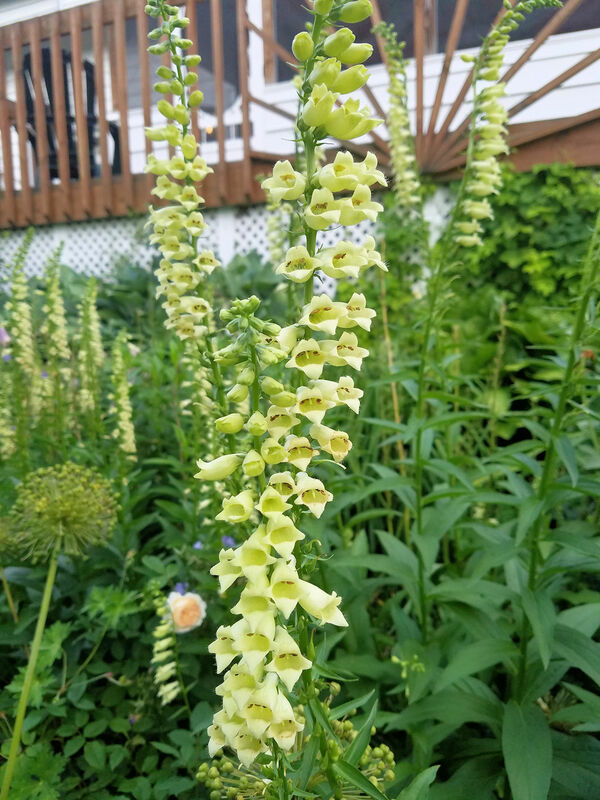 I am growing that yellow foxglove and looking at your success, I am moving mine as it has never thrived in its current location to the degree that yours is doing. 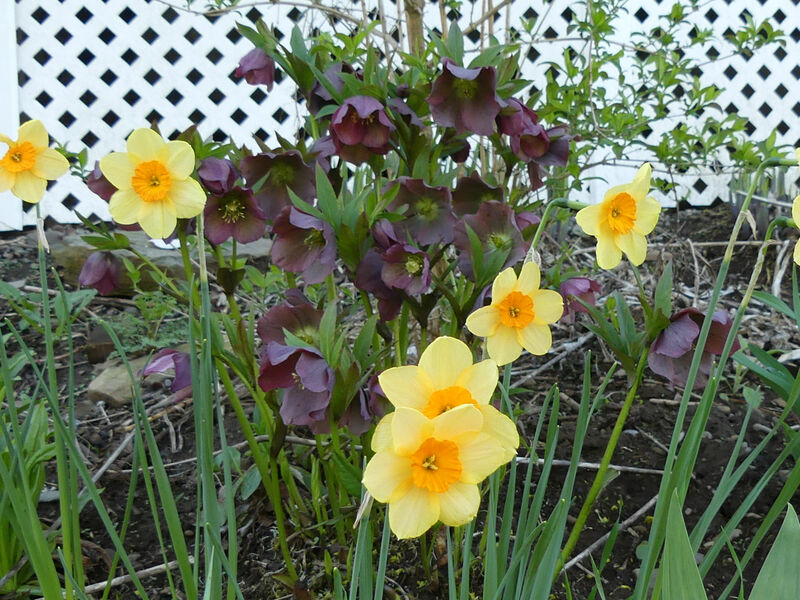 New Hellebores, Epimediums, ferns and some bulbs are in my plan book. Still some snow on the ground but temps warming up at last. 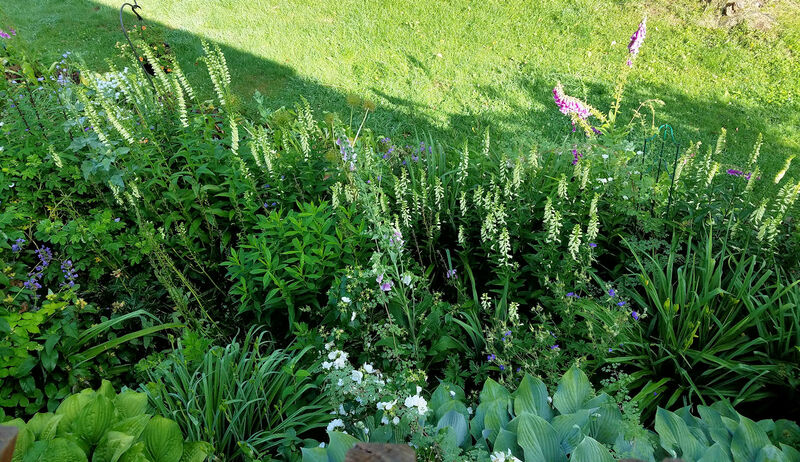 The foxglove gets a western exposure, fairly moist soil (runoff from the deck, plus what falls from the sky), and a generous helping of well-rotted manure on top of native clay. And of course, I “forget” to deadhead which enables promiscuous seeding about. Those pics! My heart is singing…. Glad to hear it, Cate. 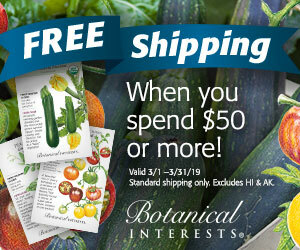 A balm for the winter-weary gardener. It’s heartening to see the progress over a few years. My backyard has a steep, shady slope, and last Fall I terraced a section of it with dirt left over from construction of a new deck, piling it over fallen brush and leaf mold. 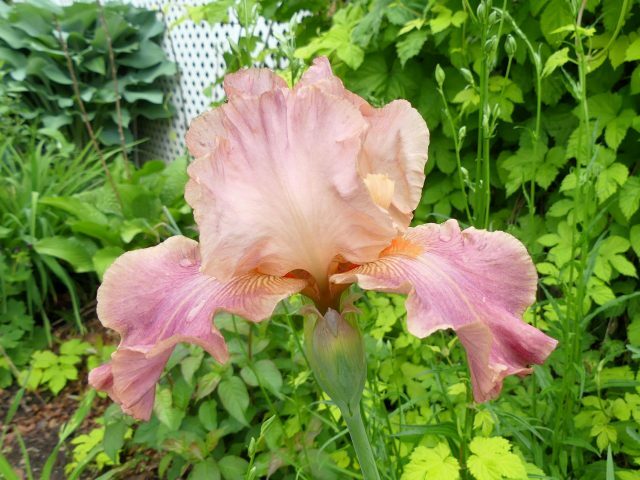 This Spring I’m eyeing the irises to see which are ready for division, and looking at the echinacea, monarda, phlox, and Veronica for divisions as well. It’s a little raw and naked looking at the moment, but your garden experience is inspiring me. By the way, I love your analogy of a garden bed to a symphony! Good luck with the new terrace! The border is lovely, Kathy, and the post is really fun to read. It shows clearly how ideas change over time, and how important it is to remain open to the shifts. Thank you, Kathy. A lovely gift as we wait for our gardens to finally wake up from gloomy winter. I loved it!!! So glad you enjoyed it, Betsy.